Fangwood Keep has changed hands innumerable times since its founding decades ago on the border between the warring nations of Molthune and Nirmathas. Over the years, both countries have sacrificed money and soldiers in an effort to control the fortress along the Marideth river valley, both for its tactical location and for its secure defences. Recently, however, the battles around Fangwood Keep have dwindled to a trickle as Nirmathas has firmly rooted itself in the surrounding valley, allowing the tide of war to shift elsewhere and peace to settle at last over Fangwood Keep. This respite was shattered by the arrival of a renegade Molthuni commander named Pavo Vos. Obsessed with capturing Fangwood Keep and unravelling the fortress's mysteries, the defecting lieutenant unlawfully used his platoon to secure the castle, much to the ire of both the Molthuni and Nirmathi governments. Now the task of bringing Vos to justice and reclaiming Fangwood Keep for Nirmathas lies solely in the PCs' able hands. 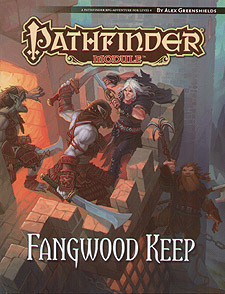 Fangwood Keep is an adventure of infiltration, investigation, and dungeon exploration for 4th-level characters, written for the Pathfinder Roleplaying Games and compatible with the 3.5 edition of the world's oldest RPG. This volume also contains a gazetteer of the Marideth River valley and a brand-new monster from the bizarre realm of the fey, both of which can easily be integrated into any campaign setting.